Why? Because you want the most secure installation possible. WordPress is built on a database and vulnerabilities are discovered over time in any database system. Once such securities issues are discovered they are fixed, hence the new version. Sometimes the update adds useful new features. In either case the update is a good idea, but of course any update can have unintended consequences. Unintended consequences is geek speak for the darn thing broke. WordPress is always in a very fast development cycle. 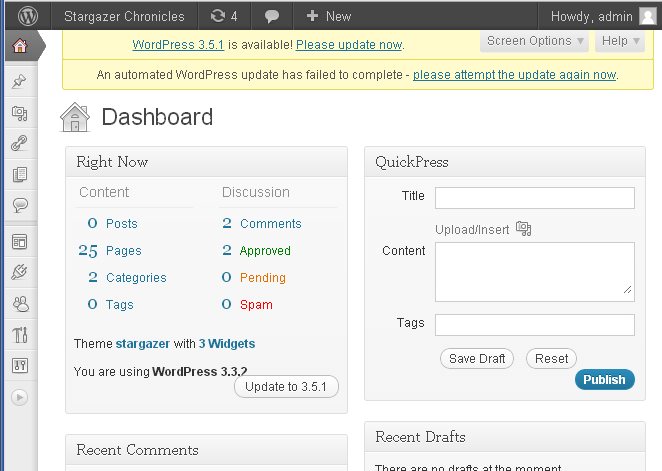 New versions of WordPress roll out often and minor updates more often. Even so, your website will continue to work as it is without updating versions. In fact, there may be a reluctance to update since we all know that anything new can come with new bugs. In a vacuum I would tend to agree, but the web is far from a vacuum. 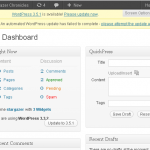 When do I update to the newest version of WordPress? The simple answer is to update when there is an update but of course any update could cause an issue with an installed plug-in. My advice is to do the WordPress version update as soon as the administrator (you) has a bit of time to do the update and then check the site to make sure everything is working. Do not do an update before an important event in which the website may play a role, since if the update does cause a problem (breaks a feature) you may need time (or help) to sort it out. What do you mean break? What might break, after a version update, is an installed plug-in. Plug-ins can be an important part of you site. Plug-ins have updates too. In general it is a good idea to keep plug-ins updated along with the WP version updates. However, depending on the plug-in developer these updates can be rare, and over time, the version of WordPress will pass the plug-in and it will be out of date and might not work. That is rare in the short term and may only be an issue if a favorite plug-in is very old. Updating can be much more of an issue when it comes to plug-ins. It is quite possible that an update foryour plug-in will break the plug-in. Or the update will remove features to motivate users to buy the pro-version of the plug-in. I have seen both of these outcomes to a plug-in update. Given that one should update, but an update might hose a feature, what is the solution? What I recommend is to make a backup of your installed plug-ins. This can be done with software (ironically with a backup plug-in) or a third party service. However, if you can handle ftp (File Transfer Protocol) you can merely make a copy of the plug-in in a folder on a local computer. Of course it helps to know where the files are. The ftp path in WordPress is : /wp-content/plugins. I try to have a copy of plug-ins I use for any site stored for my use, so if you do find a plug-in update fails and you need your old plug-in back, we should have an old version filed away. Of course that is not foolproof since even I clean my hard drives from time to time. A very low tech solution is to merely download the zip file for each installed plug-in and save to your computer. If you are looking for plug-ins on the WordPress plug-in site (not from within WordPress) you can download the file. Should I backup my site? Depending on who hosts your site, it should already be backed up by the host. However, if you are an active administrator and fuss with your site settings, then I would recommend some sort of additional backup system. Most issues for a website actually arise by administrator error. So, even a free backup plug-in could be worth your time to install and use. While WordPress is empowering, it can also be daunting and does require the administrator or content editor to keep up with new version features and/or learn how to be more efficient in working with the system. In this section we will point out good online information to add to your tool box for just-in-time learning. If you don’t know about WordPress.tv it is time you learned. Admittedly the information here might seem like it is aimed at power users, but there are also useful how-to videos. Plug-ins are born, grow old, and sometimes die. Every day brings a new crop of plug-ins and since I am in a constant state of plug-in hunting, it seems wise to share some top ones. Share your website with others. Places a “Send Link” form on on blog post allowing your users to tell others about your site.